Our team recently relocated to Austin, Texas — more than 1500 miles and 24 hours from what used to be home: Annapolis, Maryland. And while moving is certainly exciting, it also creates a lot of challenges. There’s packing to do, information to update, sad goodbyes, and of course: The often dreaded home search. What goes into high-converting real estate landing pages? What ultimately causes a visitor to inquire about a property online? How can agents better incentivize prospective buyers to take action online? What agents did the best job of capturing information on a landing page? As digital marketers by trade, we studied our own consumer behavior, and we became incredibly interested in what incentivized us to choose our homes, apartments, and our agents. After comparing experiences, we realized how impactful quality real estate landing pages were in our searches. If you’re a real estate agent, a marketing agency working with real estate clients, or a consumer wanting to learn more about how real estate marketing works — this article will cover everything you need to know about building high-converting real estate landing pages. We’ll cover demographic changes amongst buyers, takeaways from our recent real estate search, and examples of effective real estate landing pages that you can use as inspiration for your site. Think back to when you rented or bought your own home or apartment. How did you approach the process? If you’re like most Americans, there’s a good chance you probably turned to the Internet at some point during your most recent real estate search. Nine out of every ten home buyers rely on the Internet as one of their primary research sources, and 52% of home buyers turn to the web as their first step. That’s an incredibly high percentage — roughly 1 out of every 2 buyers will be starting their search online. And when we look at data on Millennials, the generation the press can’t stop covering, the numbers are even more daunting. According to a 2017 study by the National Association of Realtors, 99% of millennials use the Internet as part of their home search process. Millennials make up the largest group of first-time home buyers at 66% of the market — and projections show that Millennial buyers will continue to be a powerhouse for years to come. The homeownership rate among households headed by someone under age 35 (aka millennials) rose to 36% in the fourth quarter of 2017 from 34.7% in the fourth quarter of 2016. In short, putting a sign up in the front lawn is no longer sufficient if you want to win customers and sell properties. The best real estate agents are using digital marketing strategies to put the right listing in front of the right buyer at the right time. Consumers have changed, and it’s important for real estate agents to meet customers online. The best way to do so? An effectively lead capture through a high-converting landing page. Read on to find out for examples of effective real estate landing pages, the key elements of landing pages, and our guide on how to set up pages. Short, effective headline that gives a clear value proposition to the visitor. A simple submission field to quickly collect your name. The “featured in” section with NBC, LA Times, CBS, and other networks adds a level of trust to the page. The page uses customer reviews from several well-known sites to establish trust. Further trust is built through customer testimonials as you scroll down the page. There’s a clear option for both “Sellers” and “Buyers” when you land on the page. The CTAs are built to identify what category you fall in and funnel you to the appropriate next page. The headline “Find the Perfect Real Estate Agent” is short, to-the-point, and effective. Even though this is one landing page, it creates a tailored experience for sellers, buyers, and those simply seeking a home estimate. By including the logos of major publications (Fortune, Forbes, WSJ) at the bottom of the page, you’re given a reason to trust the landing page. The subheadline clearly shows why Rex is different than other brokers in town. Rex adds a layer of exclusivity to their submission field. By saying “enter your address to see if you qualify” — they make it seem like it’s a rare thing for homeowners to qualify and work with them. While the background image isn’t of a specific property, it’s very clearly Austin, the market where we’re searching for homes. The background image is high-quality and interesting. “How much is my home worth” is simple, to-the-point, and the first thing your eye catches when you hit the page. “Get started” is an effective CTA because it encourages the user to take action without pushing the user. So, what are the general guidelines for building a landing page? Opt for photos of the real property you’re describing. Put yourself in the customer’s shoes. If they land on your landing page, you have a matter of seconds to make an impression. Quality photos of the home you’re selling are one of the biggest factors in improving conversion rate. Consider spending a little bit of extra money on hiring a photographer — or if you’re using stock photos, make sure they’re quality (we use unsplash.com for our stock photographs). Your prospective buyer or seller is going to decide whether to read your page or bounce in a matter of seconds. You need to clearly articulate why they should continue paying attention to your page. If they’ve already clicked to your page, you’ve done a good job incentivizing them with your ad — they’re warm. Now, make sure your headline reflects the reason they visited the page and provide an opportunity to give them further value. If the headline is the hook, the supporting copy is the fishing line. You won’t be able to close the deal (get a buyer or seller’s contact information) unless you are able to make your prospect read through your page and click your CTA. Don’t be wordy, but provide enough context that a visitor understands what you’re offering. Humans love free things. It’s why we stand in lines for free food even if it means downloading an app, giving away our email, or giving up an hour of our time! The same logic follows for landing pages. If you’re going to be asking for an email address or phone number from a visitor (something of value) — giving away something to your visitors is important. You’ll want to choose an item that is on topic and provides something that they actually want (i.e. a home value calculator, a guide to the city, your favorite spots in a neighborhood, a full pamphlet on the listed property). Changes to a CTA button can make or break your landing page. Visitors are extremely susceptible to small changes in diction, color, or shape. To improve your landing page conversion rate, test variations of your button, or study examples from other marketers you respect. Social proof works because it’s deeply ingrained in human psychology. Show your potential buyer that they might miss out their dream house by displaying the number of visitors that have recently viewed the listing. You’ll be shocked at the increase in conversion you’ll start seeing by simply displaying the numbers you’re already tracking on the backend. Most likely, you’ll acquire traffic to your landing page through paid ads (social, display, SEM) or organic search. If you use social or display ads, you know about your potential visitors through your targeting criteria and the creative that incentivizes them to click your ad. You’ll use that information to build a tailored landing page that meets their needs. These searchers are providing information about what they are looking for in a property to a search engine, and they’re hoping to find relevant information in their results. By keeping their queried search in mind as you design a page, you’ll be providing relevant information that will lead to a higher conversion rate from your landing page. On the demand side, you’ll likely face competition from other real estate agents, homeowners listing their own properties, and tech companies focused on lead generation. And what happens on the supply side? How do you really know when someone wants to sell their home? You then can point these searchers to real estate landing pages (or seller landing pages) that ask for contact information in exchange for providing something of value. You can also provide a resource like a valuation, a guide to the neighborhood, or a mortgage calculator — really anything you think your potential seller would find interesting! In short, you’re giving visitors something of value in exchange for something of value. Once you decide on what type of visitor you want to target and you understand how visitors will be landing on your page — it’s time to get working on building out your page. These landing pages should be well targeted to the search that is being conducted. For example, if the searcher is seeking information about a specific property, like 123 First Street, it’s more effective for you to put relevant information about that property in front of the visitor. You want to show photos, information, and pricing rather than generic information about your real estate business. Now that we’ve established the importance of building real estate landing pages for your listings or your brokerage, you’re probably curious how to go about getting a page live. Unbounce is a software program that is one of the easiest ways to get a landing page up and running. With their software, you’ll never have to code or design — you can simply drag, drop, and edit text all through their landing page builder. Unbounce is one of the first landing page builders, and it used to be the only platform with dynamic text replacement (a huge pro for PPC marketers). Unbounce provides a plethora of real estate squeeze page templates designed just for agents. Plus, if you’re using WordPress, as we do on our blog, integration is super easy. What does the landing page template do well? Includes a prominent photograph showing the beauty and luxury of the property. Displays 3 bulleted value props that provide digestible bits of information for the visitor. The clear headline gives the reader reason to keep reading down the page. The CTA is clear, and clicking is encouraged by an arrow & the supporting text. Instapage is another landing page software program used by digital marketers. It has many awesome features, but we love that you’re able to A/B test easily and see your results through their built-in analytics tool. Marketers trust Instapage for its vast integration features and the easy-to-use interface. Leadpages is another online tool that allows you to create webinars, lead magnets, and of course: landing pages. It’s similar to Unbounce and Instapage, but it’s been criticized by many marketers for its limited customization features. But if you’re new to setting up landing pages — that can be a benefit as it’s easier to use. Have you ever bought something because someone else did? If you’re not lying to yourself, the answer is yes! Social proof is the psychological and social phenomenon that our own behavior is impacted by the influence of the actions, attitudes, and beliefs of other people. 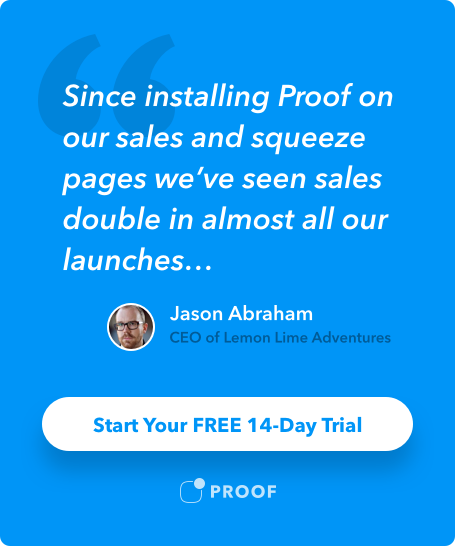 And Proof is a software tool that taps into this psychological underwiring by providing real-time notifications that increase conversion on your site. Proof will display recent purchases, live visitor count, and other metrics that are optimized to increase conversion on landing pages. Over 15k companies trust our software to see a 10-15% conversion lift on their pages. Once a visitor is on your landing page, you’ve done half of your job. You’ve incentivized a visitor to click through to your page and pay attention to your brand, and they’re warm to your marketing message. But when they’re about to bounce off your page, wouldn’t it be great to have one last try at getting them to provide their info? Luckily, there’s a great tool for this! Opt-in Monster provides exit intent overlays that can provide a guide or signup to a customer as the mouse towards the exit or back button. Here’s are examples of some of their well-performing exit-intent popups that you should add to your landing page. Google Optimize is a testing and personalization tool from Google that you can use to launch out A/B tests, redirect tests, and multivariate tests for your landing page. It’s a free tool, and it integrates incredibly well with Google’s suite of tools. If you’re looking to set up a test, our friends at ConversionXL have a quality article about getting Google Optimize up and running quickly. Sleeknote is another powerful software tool that allows you to engage with potential buyers that visit your site. With their tools, you can send potential buyers and sellers targeted offers, guides, and other items to encourage action. Once your real estate landing page is live and you’ve set up some conversion tools on the page, it’s time to start pushing traffic to the page. You’ve already decided where your traffic will be coming from. But now it’s time to put the page in front of the right eyes! If you’re putting the page behind a Facebook or display advertisement, you’ll need to come up with some catchy copy and an image that relates to the page. You’ll then want to launch your ad sets and start running some testing to lower your CPA. If you’re running a PPC campaign towards your page, you’ll go ahead and setup your campaign on Google Adwords at this point. While the Adword learning curve can be steep, there are many great online resources that can get you started. But if you decide to try to organically rank your landing page (and forewarning… this isn’t easy), you’ll need to make sure that you are following on-site SEO best practices and then start building links. We turn to the folks at Backlink.io for their tips on on-site SEO and link-building. We hope this article has helped give you better context on what goes into a successful real estate landing page, and how you quickly get one set up to start generating leads. It’s important to remember that you need to always to think about the potential buyer or seller first when you’re setting up a landing page. If you build your page with the intent and the journey of your potential client top of mind, you’ll be on your way to successfully make a sale or acquiring a new listing. Wish we’d focused on something else? Have an example you think we should include?